Oxfordianism. A Valediction Forbidding Mourning. Killing daft imposture with candlelight. To Blackfriars, with its audience dry. 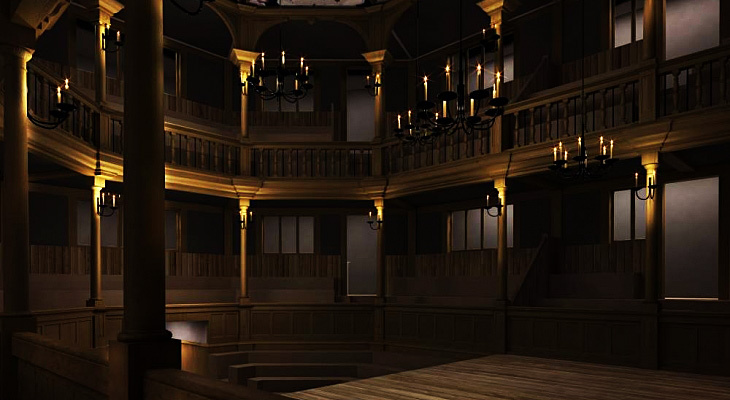 London now boasts two Shakespearean replica theatres. Now, one lovingly recreated Shakespearean theatre to which Oxford had no connection might be deemed a misfortune but two, one of which Will didn't use until after the Earl was dead, are going to spell disaster. Although he was never a professional playwright, it's not quite true that Oxford has no connection to professional theatre. In addition to patronising two groups of players, one an adult group, the other a children's group, the Earl was a one-time lease holder of a theatre in Blackfriars. Oxford's theatre connections are a poison chalice for Oxfordians. The more they make of them in their attempts to polish the earl's playwrighting connections, the less explicable becomes the fact that all Shakespeare's plays are connected to other groups and other theatres. Patronising two companies yet turning a third company the most renowned and successful in history without either profit or credit is inexplicable behaviour on the part of the Earl. You might even call it laughable in the mouth of someone who complains about the lack of evidence for Shakespeare's authorship. For the Earl's Blackfriars was not the same Blackfriars theatre the King's Men used from 1608. Oxford's name went on an earlier Blackfriars theatre lease in 1583 as part of a series of sub-lets designed to prevent the building's owner repossessing it, a recovery he finally managed in court, a year later in 1584. John Lyly, Oxford's servant or protégé, produced two of his plays there with the boys company sponsored by Oxford. It's not the most awe-inspiring impresario career of the 16C, though many Oxfordian accounts like to portray it so. Andrew Dickson's Guardian review of the finished theatre perfectly circumscribes the dire straits in which Oxfordians now find themselves with the trimmings and trappings of the Late Romance genre now front and centre in popular Shakespearean thought. Indoor theatre wasn't only different for audiences: it changed the way plays were made. 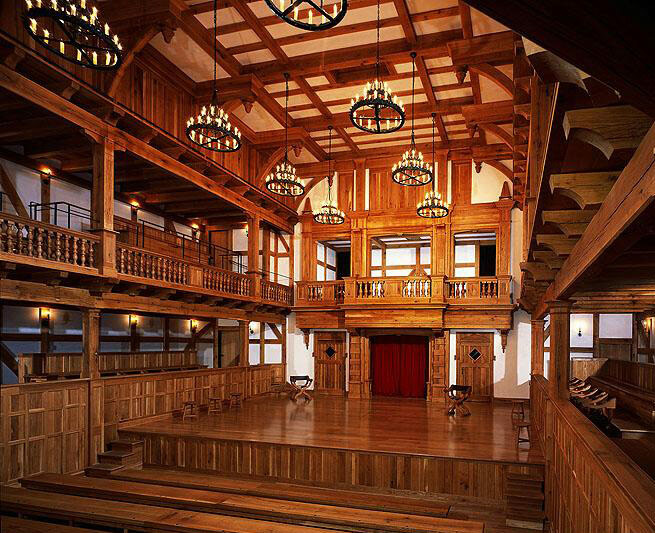 Shakespeare cut his teeth writing epic dramas for the big open-air playhouses, from multi-part history cycles to the sunny out-of-doors comedies As You Like It and Much Ado About Nothing. As the Jacobean period wore on, though, his scripts become more intense, as if adjusting to the space they now inhabited. "They have a photonegative quality," says Karim-Cooper. "You put A Midsummer Night's outside and it just makes sense, but inside it has a completely different feel." Purpose-built indoor theatres also allowed theatre-makers to flex their creative muscles. Following James I's taste for masques – eye-wateringly lavish entertainments performed at court – Jacobean scripts begin to bristle with complex special effects: sudden descents of mythological figures (lowered on a device not unlike Russell's winch); strange apparitions in the so-called "discovery" space at the back of the stage. Shakespeare's The Tempest opens with a violent storm (thunder was often created by rumbling a cannonball through a pipe) and overflows with instrumental and sung music. Cymbeline, another late play, requires the god Jupiter to "descend in thunder and lightning, sitting upon an eagle" and then – somehow – throw a thunderbolt. Music was of crucial importance too: the Blackfriars had its own handpicked group to provide atmospheric accompaniment. How can Oxfordians explain the Earl's death in 1604 now everyone else can see what he didn't? The Jacobean Late Romance genre in its original, 1608 home. It is the definitive answer to 'The 1604 question'. Definitive, certainly beyond any current Oxfordian argument. They'll need some new stuff, now. Photo Essay on the build.